The Superman Fan Podcast: Episode #264: Superman Comic Books Cover Dated January 1962: Superman #150 & Action Comics #284! 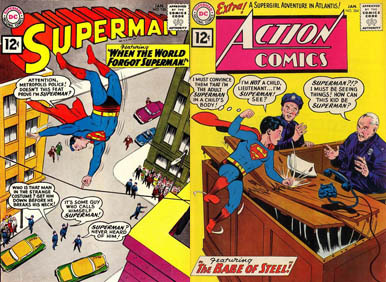 Episode #264: Superman Comic Books Cover Dated January 1962: Superman #150 & Action Comics #284! Superman 150 & Action Comics 284! SUPERMAN 150, January 1962, was published on November 7, 1961. It contained 32 pages for the cover price of 12¢. The editor was Mort Weisinger, and the cover was pencilled by Curt Swan and inked by George Klein. All three stories have been reprinted in SHOWCASE PRESENTS: SUPERMAN vol. III. This issue was previously covered back in Episode 151, along with ACTION COMICS 150. - THE ONE MINUTE OF DOOM (9 pgs. ), was written by Jerry Siegel and drawn by Al Plastino. This was Siegel's 35th silver age Superman story, and his 93rd over all for the era. Previously, he wrote THE BIZARRO PERFECT CRIMES for ADVENTURE COMICS 291, December 1961, published around October 26, 1961, pencilled by John forte and inked by George Klein. - THE DUEL OVER SUPERMAN (9 pgs. ), written by Robert Bernstein and drawn by Kurt Schaffenberger. This story was also reprinted in 80 PG. GIANT 14, September 1964, published around July 15, 1964. - WHEN THE WORLD FORGOT SUPERMAN (8 pgs. ), written by Jerry Siegel, pencilled by Curt Swan and inked by Wayne Boring. This was Jerry's 36th silver age Superman story, and his 94th overall for the era. ACTION COMICS 284, January 1962, was published on November 30, 1961. It contained 32 pages for the cover price of 12¢. The editor was Mort Weisinger and the cover was pencilled by Curt Swan and inked by Sheldon Moldoff. - The 14 page Superman story was titled THE BABE OF STEEL, written by Robert Bernstein, pencilled by Curt Swan and inked by Sheldon Moldoff. This story was reprinted in SHOWCASE PRESENTS: SUPERMAN vol. III. - The 12 page Supergirl story was titled, THE STRANGE BODIES OF SUPERGIRL, written by Jerry Siegel and drawn by Jim Mooney. This story was reprinted in SUPERGIRL ARCHIVES vol. II and SHOWCASE PRESENTS: SUPERGIRL vol. I. It was Siegel's 59th silver age Superman Family story, and his 95th overall for the era, and was the 7th part of an ongoing Supergirl storyline. Elsewhere in DC Comics, 28 titles carried the January or January/February 1962 cover date, according to Mike's Amazing World Of DC Comics. Next Episode: SUPERMAN FAMILY COMIC BOOK COVER DATED FEBRUARY 1959: SUPERMAN 'S GIRL FRIEND LOIS LANE 7! In 2 Weeks: SUPERMAN ANNUAL 4!